I was considering a few of my ready drafts to be posted for Christmas. But nothing suited the joy and happiness that this beautiful festivities bring on. After many a thought I decided on this orange olive oil cake, afterall the citrusy flavours is the toast of the season. There are plenty of recipes available online. 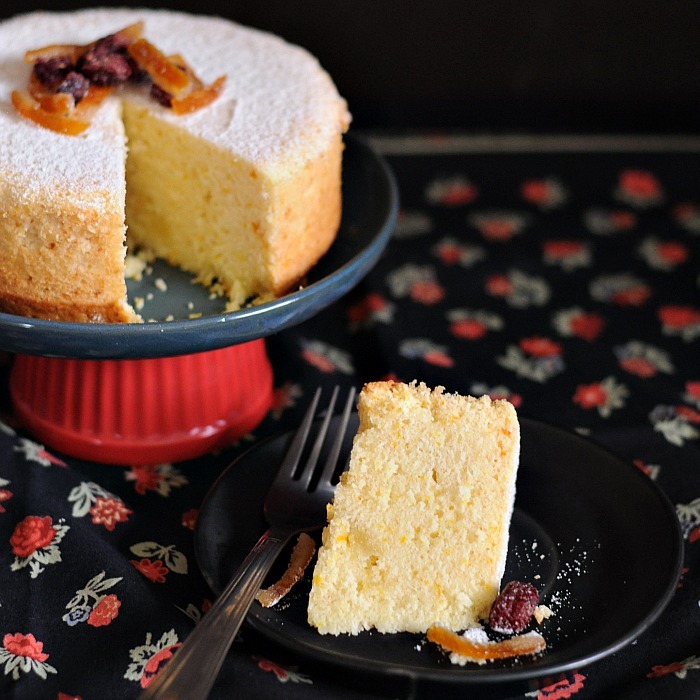 Some belong to the Italian genre where whole oranges are blended and mixed with extra virgin olive oil and almond meal, Some belong to the sponge cake genre with the eggs beaten with a handheld mixer till fluffy and light and then the oil is poured and mixed at the end. 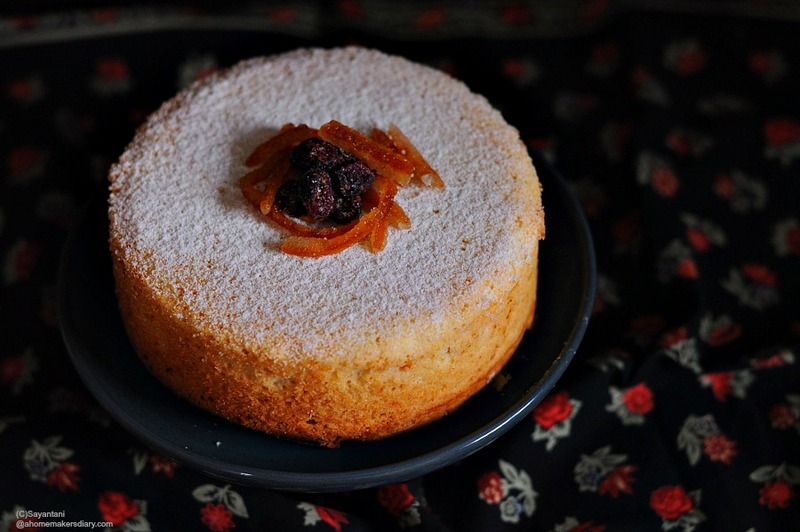 But personally I was trying to create one which is not dry or not dense rather a soft spongy moist cake with the orange flavour shining in each bite. 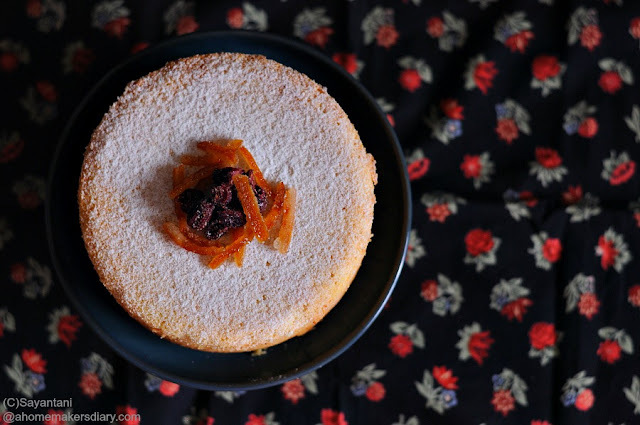 I followed this recipe of Portugese Olive oil cake by David Leite, but changed it a little bit to suit our taste. Preheat oven at 180C and line and grease a 7" pan. Sift the flour, baking powder and salt 2-3 times. Grate the skin of the oranges in this. Make sure you are not grating the white pith which is bitter in taste. Using the tip of your fingers rub the zest in the flour. Keep aside. Juice the oranges and mix it with the olive oil Keep aside. If using orangette then powder it with the sugar. Break the eggs in a big pan and put in the powdered sugar in it. Start whisking (preferably with a handheld mixer or a stand mixer ) till it's light and fluffy (7-9 minutes with a handheld mixer). Pour 1/3 of the flour mixture and fold in with a very light hand. Add 1/2 of the oil-juice and again mix. Continue till all of the flour and juice is incorporated. Make sure you are ending with the flour mixture. Pour the batter in the prepared pan and lightly tap it on the counter to knock out the air bubbles. Bake for 30-40 minutes or till a toothpick inserted at the center comes out clean. Cool in the pan for 5 minutes then using a knife loosen the sides and invert on an wire rack. Cool completely. I love your recipes. I just moved back to India and am planning to buy an oven. 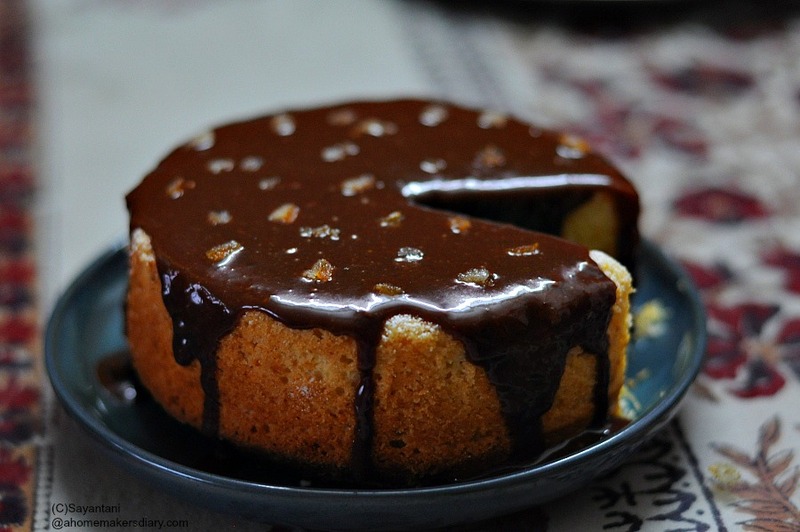 Can you please tell me which oven/OTG you use to bake such amazing goodies? 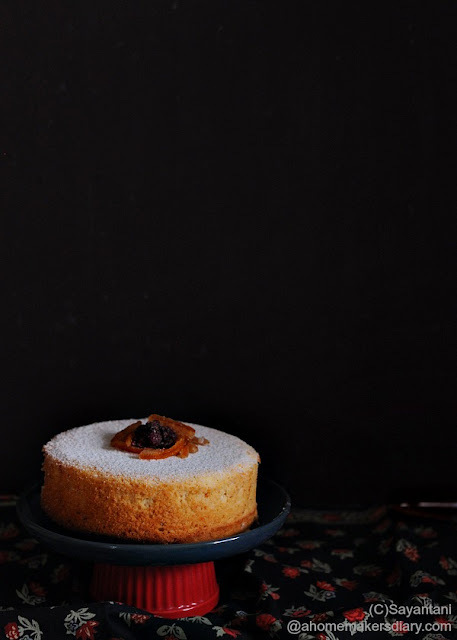 Looking for a simple Orange or vanilla eggless cake.